LOS ANGELES. 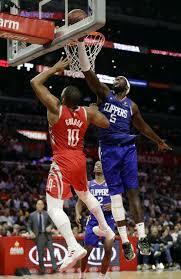 The Los Angeles Clippers survived a 31-point outburst from reigning MVP James Harden and beat the Houston Rockets, 115-112, on Sunday night at Staples Center. Tobias Harris and Danilo Gallinari provided the 1-2 punch that upset Houston, which played without point guard Chris Paul who is serving a two-game suspension for his involvement in the brawl that happened in the Lakers-Rockets game on Saturday night also at Staples Center. Harris had 23 points and four rebounds while Gallinari chipped in with 20 points, nine rebounds and four dimes. Montrezl Harrell collected 17 points and 10 rebounds while two-time Sixth Man of the Year winner Lou Williams added 12 off the bench to lift the Clippers to a 2-1 record. The Rockets fell to 1-2. Besides Harden's 31-point effort, Houston got 23 points from Clint Capela and 21 from Eric Gordon. Houston shot a high 48.3 percent from the field (43 of 89) and 15-of-35 from long distance (42.9 percent). But the Rockets only had 11 made free throws against the Clippers' 26.